Just found this – and as someone who has been helped to understand myself and others through this personality inventory, enjoyed these prayers. See what you think! (BTW, I’m ENFJ). I’ve just finished a book that uses this test to help us understand our kid’s personalities. Being that Jun is adopted, I found it to be VERY helpful and interesting. I’ll try to post about it tonight! Sue, that is the neatest prayer chart. And, I am an EFNJ just like you are!! I was also so touched by the pictures of your children in the snow. It hit me what an awesome family and life you and Eric have been able to give them. What an incredible blessing you all are to each other. I find the MBTI very helpful in ministry as well. I will share with my IV leaders – they’ll love it. might as well say let me be pessimistic about all my shortcoming and not appreciate myself for who I am. Hi Sue! We’ve never met, but we had a chance to have Eric over for dinner with the Iwakiris a few years back. I just had to laugh about this, because being an ENFP, I happened on this chart after I was directed to your website from the Fuller article which I read while I was cleaning out my inbox while I was . . . look, a butterfly! . . . I’ve spent the last few hours reading your blog and visiting the Nozomi website. I have no idea what my plans were for this morning, but I hope this was what God had planned for me. 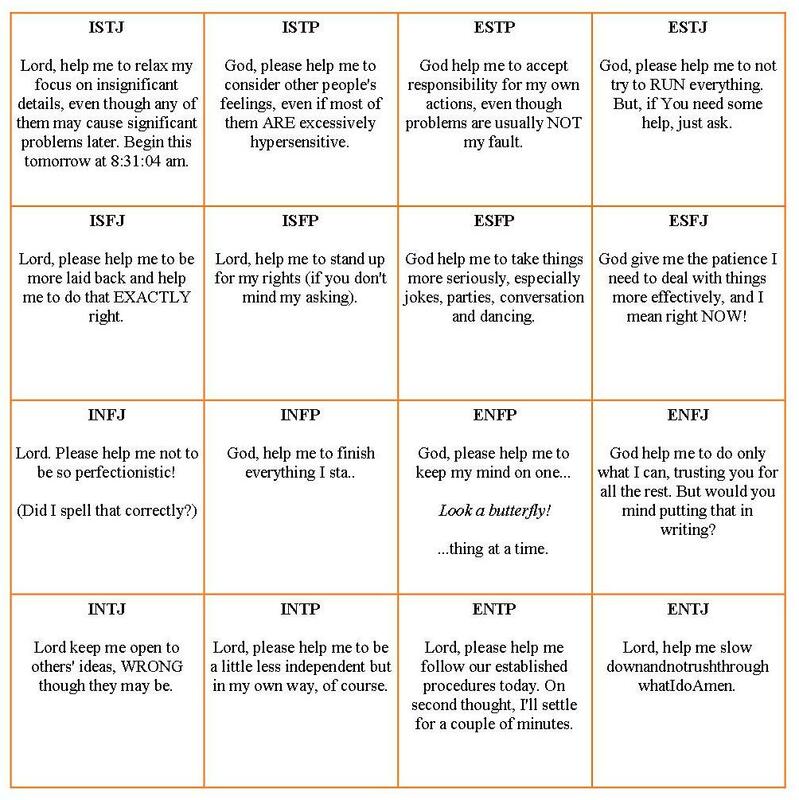 I guess I’d better pray the ENFP’s prayer every morning. Thanks, and hope to connect sometime.